Istanbul may not be modern Turkey’s capital city, but what it lacks in status it more than makes up for in culture and attractions. Home to over 14 million people, Istanbul has long been the most populous city in Turkey and has played a significant role throughout global history. It has been the capital of two of the world’s most powerful empires — the Byzantine and the Ottoman — as well as an inspiration for many famous novelists like Ernest Hemingway. The city of Istanbul is believed to have been inhabited since the Neolithic period and was officially settled by Indo-European Thracian tribes, sometime between the 13th and 11th centuries BC. In the 7th century BC, Greek colonists arrived and declared the area be known as Byzantium, after head pioneer King Byzas. Thanks to its position on the Bosphorus strait, the ancient Greeks believed it would be a perfect trading and transport hub. Eventually, the city was claimed by Roman Emperor Severus and remained a key part of the Byzantine kingdom for many years. In the mid-4th century AD, Constantin the Great unified the western and eastern Roman empires, relocated the capital from Rome to Byzantium and renamed it Constantinople. The city continued functioning as capital during the meteoric rise and fall of the following Ottoman empire, where it eventually became known as Istanbul. Finally, in 1923 renowned leader Kemal Atatürk officially ended the city’s run by naming centrally-located Ankara as the new capital of the Republic of Turkey. Istanbul’s immense history, in addition to its location in both Europe and Asia, have fused to create a culture unlike any other. The buzzing metropolis is a travellers paradise and the best way to experience its sights, sounds and smells is with a stroll through the old city. 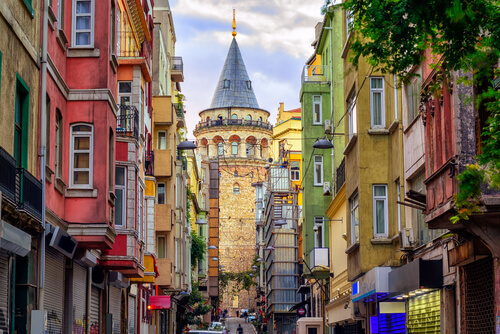 Wander Istanbul’s cobbled streets and marvel at the wide array of architecture, influenced by its diverse past. 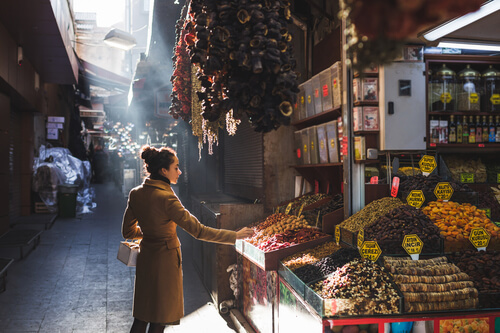 On every corner of the Sultanahmet district, there are beautiful romanesque buildings, exquisitely detailed mosques and remnants of various empires, interspersed with stalls selling traditional Turkish food. For those with weary feet, trams run across the city grid and stop outside all of the biggest tourist spots. Two of the cities most celebrated structures are the Hagia Sophia and the Topkapi Palace. Located just a short walk from one another, these two magnificent buildings are amongst the most revered architectural sites in Turkey, yet they are completely different in style and purpose. Hagia Sophia was originally built as a Greek Orthodox church during the Byzantine empire, but later became a mosque for the Ottomans. The domed roof is Hagia Sophia’s most recognisable feature, but it’s the mosaics adorning the inside walls that historians consider most significant. Topkapi Palace on the other hand, was built during the Ottoman period as an administrative centre and home for its Sultans. Fascinatingly, the buildings of Topkapi Palace are all designed differently; some are expansions of old Byzantine buildings, while others appear to have been influenced by Persian and European styles. In the heart of the city sits one of the largest covered markets in the world. The Grand Bazaar features over 3,000 stalls and sells everything from clothing to crafts, spices and souvenirs. Be sure to look up, as the building itself is an architectural marvel with vaulted roofs decorated in vibrant Turkish tiles. Visitors are encouraged to haggle as the locals do and get lost amongst the 60 labyrinthine alleys that wind across the enormous site. Bask in the intoxicating smells, chat with local vendors and be inspired by the vibrance of this 15th century souk.